Planning to visit Hong Kong Disneyland in 2019 (or beyond)? This guide will help you plan the perfect trip! As we discuss in our review of Hong Kong Disneyland, this is one of the smaller Disney resorts. The entire resort comprises just one park (Hong Kong Disneyland) and three hotels. Read on to learn everything you need to know about Hong Kong Disneyland! The first thing to know about timing your visit to Hong Kong Disneyland is that the park is in the midst of a six-year rebuilding plan that will include two new lands (Marvel Land and Arendelle) and an expansion of the castle. Having just finished a visit in 2017, we won't be returning until 2023 or 2024, when the park will be quite different. Additionally, Hong Kong Disneyland's 15th anniversary will be in 2020. We won't know for a while whether we can expect celebrations, but it might be worth waiting just to see. If you're going to visit in 2018, though, the first thing that comes up when picking a time of year to visit Hong Kong Disneyland is to avoid the summer. The months of May through September regularly see highs over 80 degrees, but it's the unbearable humidity that really keeps people away. Hong Kong Disneyland celebrates both Halloween and Christmas. We found the Christmas offerings to be quite excellent, and along with the very tolerable temperatures, this made late November and early December a great time to visit. 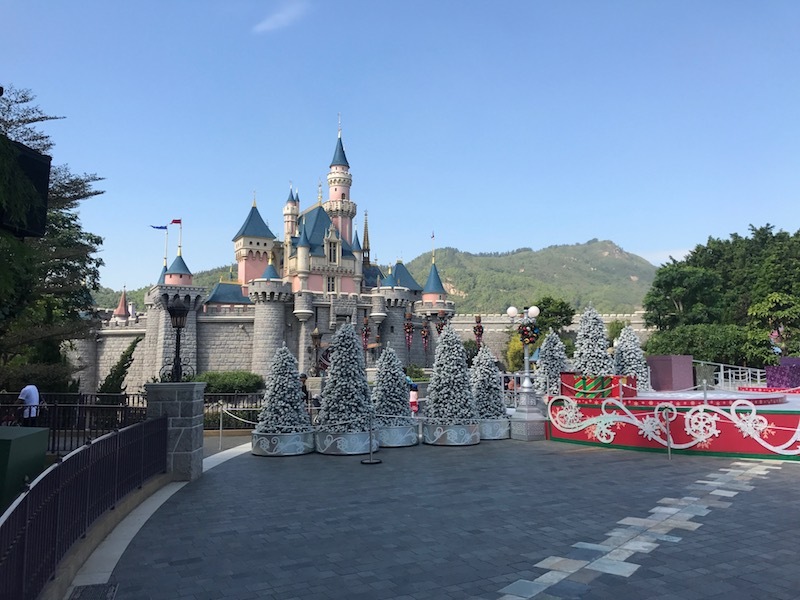 Christmas was a great time to visit Hong Kong Disneyland! In it's current state, Hong Kong Disneyland can easily be seen in a single day. Because park tickets are relatively inexpensive (adding the second day often costs only $8 more per person), we suggest doing a single night on Disney property with two park days on either side. Beyond that, you could add a few days to see Hong Kong, or you could combine this trip with a visit to Tokyo Disney Resort or Shanghai Disney Resort. Hong Kong Disneyland is about 30 to 60 minutes from the city center by train. You could stay downtown and visit Hong Kong Disneyland, especially when park hours are narrow (e.g. opening at 10:30 and closing at 8PM). When booking hotels, be sure to check all the major players for the best rates: Expedia, Hotels.com, and Booking.com are some of our favorites. If you're staying in Hong Kong downtown, we suggest using an Airbnb if you're interested in a budget stay (we stayed in the heart of the city, Tsim Sha Tsui, for under $50 per night). Or, if you're interested in a luxurious stay, we loved our time at the Ritz Carlton Hong Kong ($400+ per night). The Ritz is also located on the Tung Chung Line, the train line you'll need to use to get to Hong Kong Disneyland by MTR. Staying at least three nights? Get your 4th Night Free using a Citi Prestige card. We spent two nights at Disney Explorers Lodge (~$250 per night) and loved it. It was a beautiful resort, certain worthy of a night. The lobby of Disney Explorers Lodge. The neighboring Hong Kong Disneyland Hotel and Hollywood Hotel were also fine spots in our estimation as visitors to their lobbies and bars, but Explorers Lodge is really a notch above design-wise and reflects the recent surge of improved design common at newer Disney hotels. Getting to Hong Kong Disneyland breaks into three parks: Getting to Hong Kong by Plane, Getting to Hong Kong Disneyland from the Airport, and Getting to Hong Kong Disneyland from Downtown Hong Kong. Flying to Hong Kong International Airport (HKG) from the United States is a bit intimidating for some people. It's usually about a 14 hour flight, and outside of major cities will require at least one, if not two, connections. Rates for flights to Hong Kong vary, but on most days you can find sub-$1000 flights and and on many days sub-$500 fares pop up. These are economy rates, so you'll want to consider carefully how comfortable you are spending 14 hours in economy class. A round-trip fare chart for ORD (Chicago) to HKG (Hong Kong). Plenty of sub-$600 fares available. An alternative to purchasing your fare is to use points, especially to fly in a higher cabin like premium economy or business class. We highly suggest doing this for at least one leg of your flight, probably the leg from the US to Asia, as that will usually be overnight. Mouse Hacking Tip: Charge your flight to a high-earning card, like the Chase Sapphire Reserve (3x on travel) to earn maximum points. We've previously discussed how we booked our flights to Shanghai using points. You could use the same strategy, even on the same airline, since Korean Air flies to Hong Kong, to fly business class to or from Hong Kong. Hong Kong Disneyland is just a 20 minute taxi ride from HKG airport. Both are located on Lantau Island a ways from the center of the city. To take a taxi, you'll follow the signs for taxis and then for taxis to Lantau Island specifically. While it's always helpful to have your hotel address in English, Cantonese, and on a map, you'll usually be fine just telling the driver the name of your hotel and adding "Disneyland" at the end. We're lovers of mass transit, but we would not advise planning to take the train to Disneyland from HKG. You have to go into the city and then back out, easily spending two hours or more in transit. Hong Kong Disneyland has its own train line, the Disneyland Resort Line, attached to the Hong Kong MTR. That line operates between a single stop at Hong Kong Disneyland and a single MTR stop, Sunny Bay Station. Sunny Bay Station sits on the Tung Chung Line, which itself stops downtown at the centrally located Hong Kong Station. The Hong Kong Metro is incredibly straightforward to use, especially when paying by Octopus Card (discussed more below), as you just tap when you enter and exit the station to have the fare deducted from your card. If you're not paying by Octopus Card, there are numerous ticket machines scattered throughout the stations. These machines have an English option and are very intuitive to use. Just choose your destination station, deposit your cash (cash only), and receive your ticket. The ride from downtown to Hong Kong Disneyland costs around HK$20 or about $2.50 (US). Hong Kong Disneyland offers one- and two-day tickets. For the past few months, whenever we've looked we've seen an ongoing ticket deal discounting the second day. And, as of this writing (Dec. 12, 2017), there is also a deal where a single day ticket comes with some minor perks. The only other discount source we know of for Hong Kong Disneyland tickets is Klook, which we used for a variety of other discounts around Asia (but not Hong Kong Disneyland). Screenshot of one of our Hong Kong Disneyland park tickets. The standard ticket prices are HK$589 (~$75) for an adult one-day ticket, HK$759 (~$97) for an adult two-day ticket, and HK$649 (~$83) for the discounted two-day ticket. When we first went to buy our tickets, the two-day deal did not cover our dates, so we waited a few weeks until it did. Unlike Shanghai Disneyland, where we used our passport to get printed tickets at the entry, Hong Kong Disneyland tickets can be entirely digital, so you might not have a paper ticket, just the QR code on your phone (picture above). However, we still did need our passport for identification when we entered the park! Hong Kong Disneyland is much closer to Disneyland Paris than Shanghai Disneyland as far as cultural difficulties go (that is, its very easy to visit). English was incredibly common, and western food was readily available. As far as attractions go, English was not forced into every attraction like it was in Disneyland Paris, but it was present in some form (like subtitles) on most every attraction. 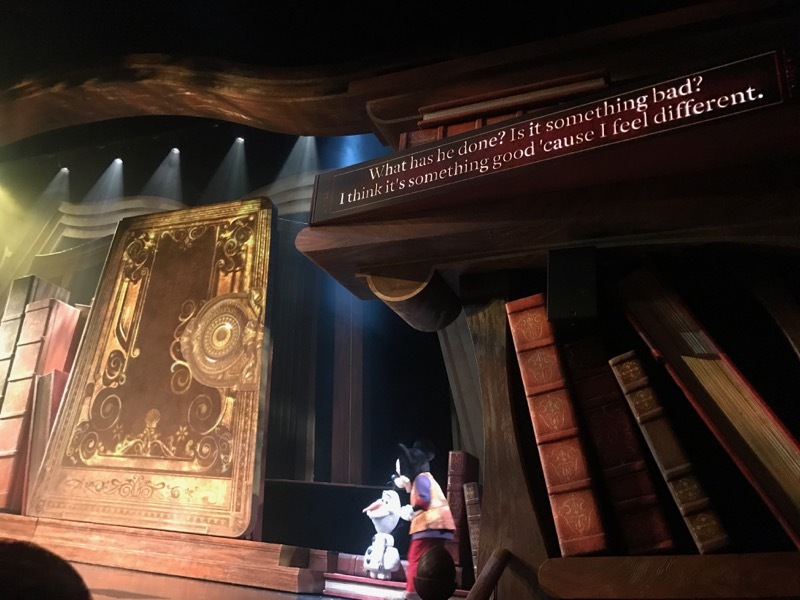 English subtitles at Mickey and the Wondrous Book. Hong Kong uses the Hong Kong Dollar. Credit cards are widely accepted at Disney, except at small stands. Also accepted throughout Hong Kong Disneyland is the Octopus Card. Hong Kong's Octopus Card is essentially a touch-to-pay transit card that can be used at a huge number of locations throughout Hong Kong. Honestly, the first thing you should do when you step into a transit station in Hong Kong is visit a booth with a person and purchase an Octopus Card. You'll need HK$150 cash to put on the card (HK$100 is value, the other HK$50 is a refundable deposit that allows you to go below zero). You can add value in HK$50 increments to your Octopus Card at machines throughout Hong Kong and at 7-Eleven. When you're done with your card, you can take it back to MTR and get the balance and deposit refunded. Over at Lattes & Runways, we've written more about money abroad. In that post, you'll find more about our suggested tips for getting cash and making sure you've got the right credit cards for your trip. Hong Kong Disneyland has a free wifi network that we utilized with minimal issues throughout our trip. It was not 100% reliable, but when we had issues they were limited. We also suggest buying a local SIM card if you're at all concerned about being able to connect outside of wifi. We've written more on staying connected overseas at Lattes & Runways. Is there anything we forgot to cover? Let us know and we'll see how we can help you plan the perfect trip to Hong Kong Disneyland!